Wow it’s been a chilly week. Winter has well and truly set in. I love the way every leaf and blade of grass is outlined with frost and sparkles in the sunlight, but I could do without the draughts whirling about our house. I’ve also been juggling work and everything else, as I had a packed day in London and my daughter was off school poorly for a couple of days (all fine now!). So without further ado, here are the five frugal things we fitted in this week. Here’s a quick hack if you use WeightWatchers Monthly Pass to pay for meetings and get access to the app and resources online. I’m sure a true frugalista wouldn’t fork out £21.45 for monthly membership but would just shift the weight themselves. Personally, I can do with all the help I can get and value the inspiration and support from meetings once a week (waves at any Hadleigh members who might be reading!). However, I rather begrudge paying for membership during December. I’m even less likely to stick to it over the festive season, and also most meetings shut between Christmas and the New Year, and may be closed on other days too, depending on the timing of bank holidays. Plus you can be pretty sure that as soon as January starts, WeightWatchers will offer cut price membership to lure in people making New Year’s Resolutions. However, the offers are only available to new members, not those of us who’ve been shelling out for months. So this year, I rang to cancel my membership back in early December. This meant I didn’t get stung for the £21.45 direct debit that month. Due to the weirdness of the way WeightWatchers charges, my membership didn’t actually expire until 12 January – but then I rejoined online two days later, taking advantage of a “30% off 3 month’s new membership” offer for £52.05. By clicking through from the cashback website Quidco* to WeightWatchers, I also earned £11.58 cashback on top. If I’d let my direct debit continue, I would have paid £85.80 for the four months December through March. (That looks particularly painful written down). Instead, by cancelling and rejoining, I only paid £40.47 after cashback – less than half the price. Want to find out more about cashback? Read this post and this one here. Want a free tenner? Get a £10 bonus if you spend £10 via Quidco! If you’ve never signed up for Quidco before, then if you join by clicking this link*, you will earn £10 cashback when you spend £10 or more with any of the 4,300+ Quidco retailers before January 31. 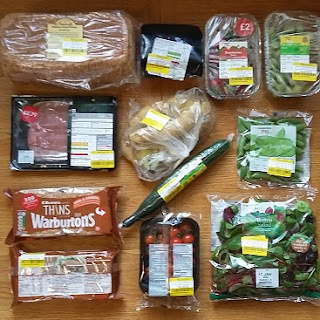 As well as shedding lbs with WeightWatchers, I’m also attempting to save ££s on our food shopping this month (Read more about my five frugal New Year’s Resolutions here). This week, I scooped up a good haul of suitably healthy yellow-stickered food at the Co-op. I needed to buy milk after dropping the children at school, and always check out the reduced shelves while I’m there. Looking at the photo from top left to right, I was able to buy malted sliced bread from a local producer, a piece of cooked ham, strawberries, grapes, decent bacon, bananas, cucumber, sugar snap peas, two packets of Warburtons sandwich thins, piccolo cherry tomatoes and a fancy salad bag, all for less than the normal price. In total it cost £9.31, down from £22.32. Admittedly, the Co-op prices tend to start out higher than many other supermarkets, but the reduced prices definitely help keep our bills down. The key is to buy either food you know you will eat quickly, or food you can freeze. We’ve already polished off everything in the pic above, apart from a few slices of bread, half the ham and one pack of sandwich thins, which are all stashed in the freezer. One big decision when moving to Suffolk was that we weren’t going to endure a daily commute to London. However, I do still nip up and down every so often, either for work or (shock horror) purely social reasons. This meant I was delighted to spot an offer from our local train company, Greater Anglia, just when I had two work trips on the horizon. 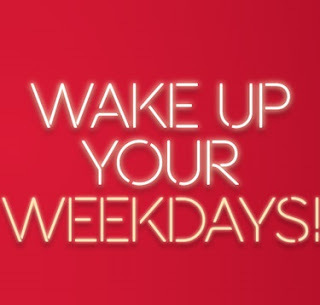 The “Wake Up Your Weekdays” promo applies to off peak day return tickets during the week (try saying that three times fast). 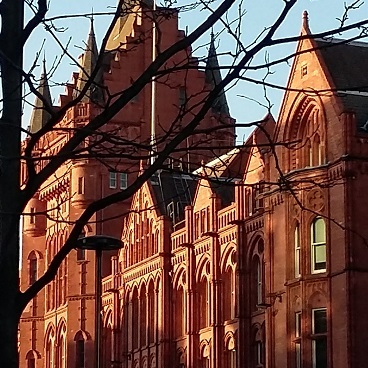 Book online before 3 February, and you can pay £10, £15 or £20 for a return ticket, depending on how far you’re travelling. Even though I can’t get a third off with my railcard, and have to pay for tube and bus travel on top, it’s still cheaper. I took advantage of the offer to book tickets for two trips and saved a bit more than £13 compared to the normal cost. As an added bonus, you can book for travel right up until 10 March – which covers half term. So now I’m planning a day trip with the kids, as you can take up to two children with you for just £2 each. After attending her first few sessions, my daughter is keen to continue with Cubs, so I bit the bullet and ordered the uniform. 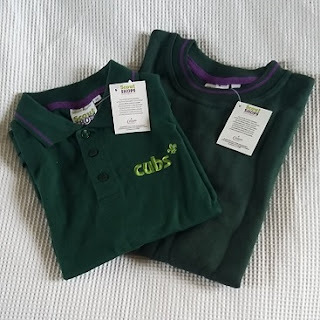 After a quick search online, I ordered the sweatshirt and polo shirt for £25.47 including delivery from Cubs Uniform, more than £4.50 less than if I’d got them from the official scout shop website (sorry Scouts). Delivery was super speedy too – I ordered on Wednesday morning, and the parcel arrived on Friday. I have attempted to buy the sweatshirt in size “she’ll grow in to it enormous”, as I don’t fancy unpicking and resewing badges on a new one any time soon. I’m putting this one out there to see if anyone else does this! 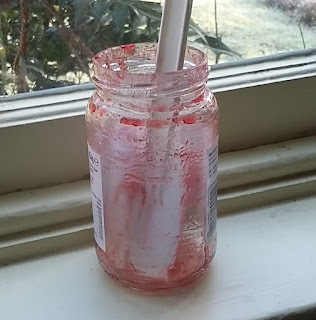 Anyone else willing to admit to taking a spatula to their jars, or having a good scrape around with a spoon, to use up the last remnants of jam, mayo or whatever else it is? Anyone? Or just me then? I reckon every little helps, so I’m going to keep on scraping away! Still need to face up to your tax return? If you need any top tips about tackling your tax return, I’ve written an article for this weekend’s Sunday Times Money section, and will also be on BBC Radio Suffolk at about 12.30 on Sunday, talking to Georgina Wroe. If you’re on the hook for self-assessment, it’s worth filing your return before 31 January, or you’ll get hit with a £100 fine even if you don’t owe a penny in tax. Great saving on weight watchers ☺ I think we need to get a bit better at investing in our health. If it costs you £20 a month, so what? This is your health we're talking about. I was anti-gym, but started up Pilate's nearly 2 years ago and my strength has improved considerably. Means I can enjoy more active holidays and more challenging walks. Sure, I don't look for ways to spend, but if it genuinely helps, that's a good thing in my book! Oh, I don't scrape mayo but I do jam and nutella… Even if it just means licking the last bit off the spoon! That weightwatchers hack is a great one!! Half price membership most impressive. I have noticed that the co-op has great healthy reduced stuff and thanks to my new education from Reduced Grub Kelly I have learned what I can and cant freeze;-) Great frugal tips Faith. Joining a slimming club might not seem frugal, I agree. We ought to be able to shift it ourselves for free – but it's so much harder without an organised group & the motivation of that weekly weigh-in. 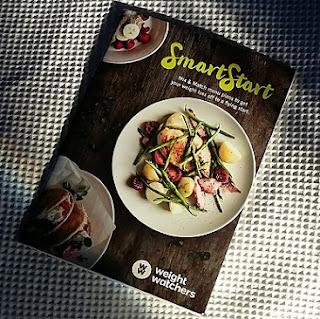 I joined Slimming World last year, & reckon in total I spent about £100 on membership/weekly meetings, recipe books etc before achieving my target weight & getting free access (if I stay in range). To shift 2 stone and drastically lower my BMI I think £100 or so is a good investment. Plus I save on all the snacky biscuits & chocs I used to gorge on! I'm also back on WW but didn't think to cancel and re join!! Fab tip!